Conditions, haircut fir, juniper, fir and PR. In the photo: the hedge of yew berries. Green fence is not only protective and structuring objects, but the picturesque outline of the garden, which gives landscape projects integrity and completeness, creates a style. The most compact and economical are sheared living fence. Original natural texture never go out of fashion ever since, when they became mandatory attribute design of Palace gardens and parks. These parts of the landscape look spectacular, but require careful care, care, do not forgive negligence and agrotechnical mistakes. One of the keys to success is the right choice culture. Yews belong to the affordable and quickly adaptable to different conditions ephedra. Krone dense, the branches are whorled, plants slowly gaining growth and easily propagated. Color – green, juicy, the surface of the fence turns thick, smooth, flawless. Advantages – minimum maintenance, resistance to pests and diseases. Green fence is low, meter. 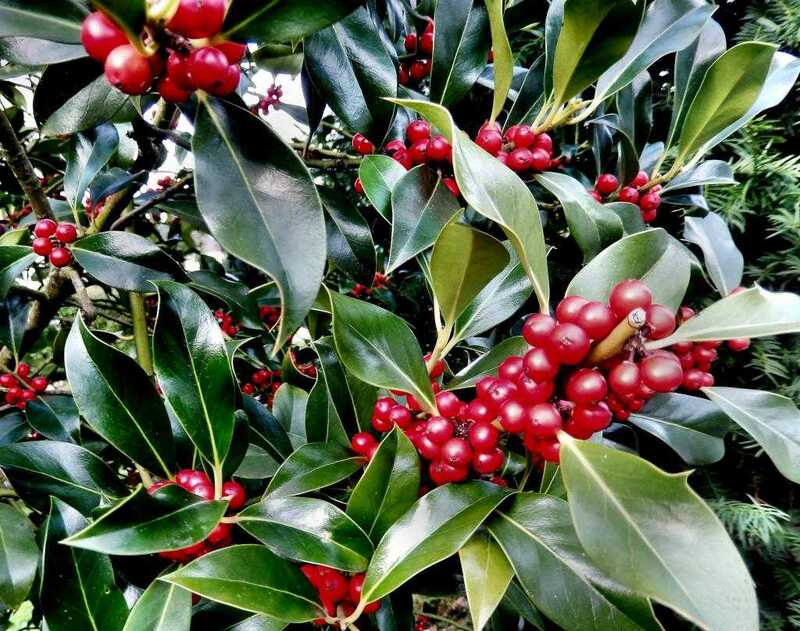 For the aforesaid purposes experienced gardeners often use yew berry and its many forms and varieties, which are selected, based on the height and the desired coloration. A high fence of yew. The most shade tolerant of conifers able to tolerate with bright lighting, but the best conditions for normal development – penumbra. The location of landings is affected by frost: in the sun she lost, in the shade – sold. Any soil, preferably loose, not too wet, medium-fertile or fertile. The distance between plants when planting a foot and a half, the depth of the trench – 70 cm. When planting the root collar should not bury. In the soil layer making complete fertilizer, the following year, fertilize yews again. To ensure quick growth and development of ephedra prior to the closing of the fence, monthly watering, loosen the soil to a depth of 15 cm, conduct irrigation. In the first two years pruning is not carried out, then begin to form a fence, shortening the shoots by one third of the length. In the first time control the growth of a dense lower tier, then allow ephedra to grow tall. Tis very tolerant of frequent shearing and severe pruning. 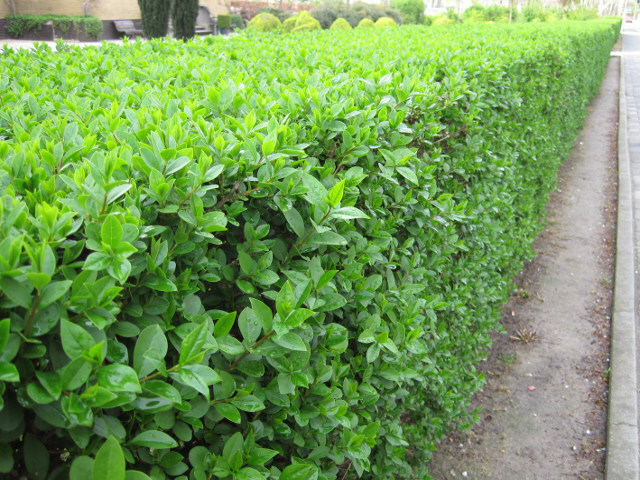 Hedges can be given a conical, rounded, trapezoidal and rectangular shape, this culture good for creative experimentation. Culture forms a dense crown with dark color, which does not change with the onset of winter. 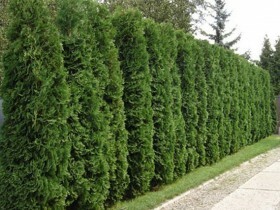 Thuja is suitable for live hedges, with a strict non-standard forms. In itself, the plant forms a smooth pyramid, almost doesn't need formative pruning. 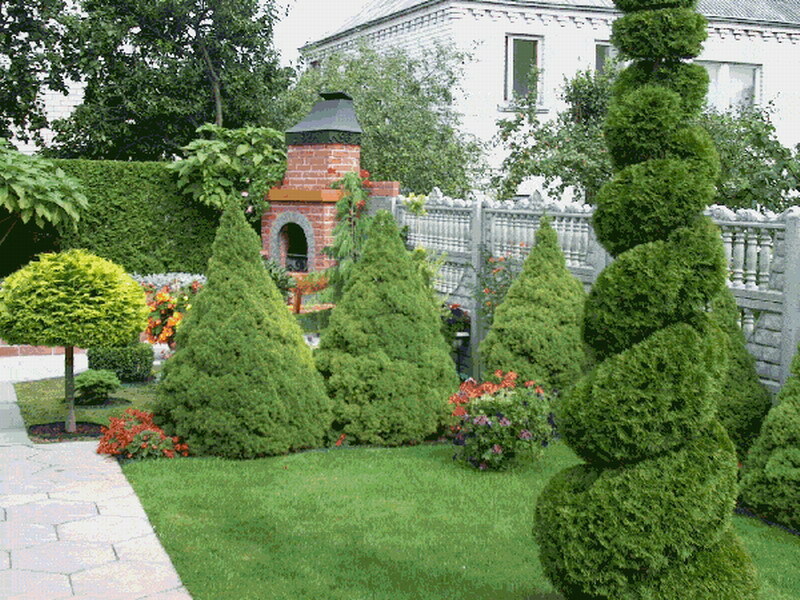 Of arborvitae often do not solid, interlocking, landing, and create a wall of cones. Each tree is generated separately. Culture looks festive and fresh, but overly strict, it is better to drop off along the walls and for the deaf zoning. 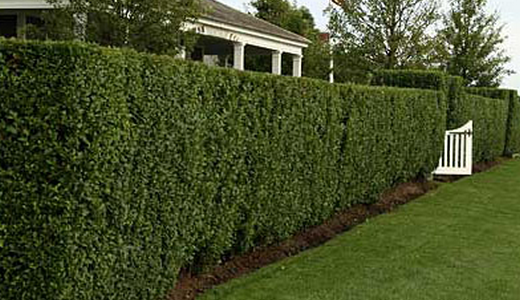 Live hedge of arborvitae can be medium and high. For planting choose varieties to fit the size, individually. 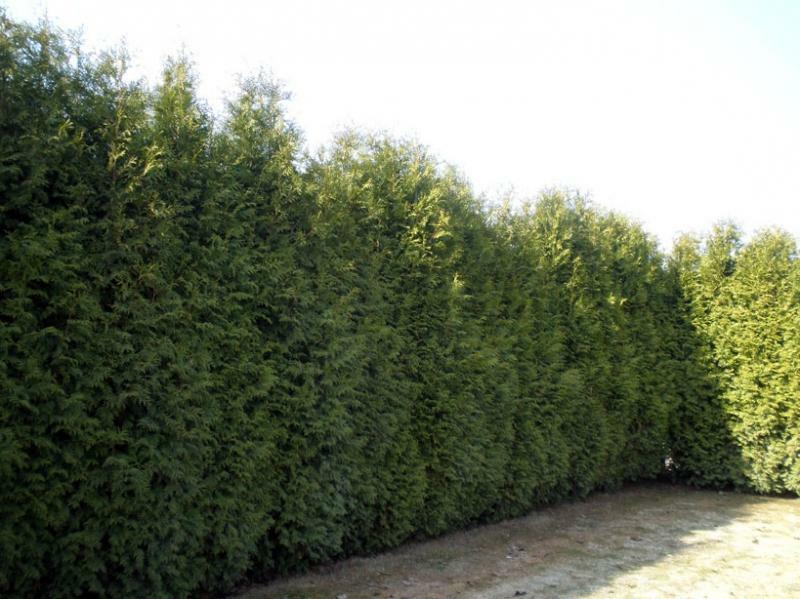 The most popular types are considered as thuja occidentalis and a giant or folded. In the latter case, shade tolerance combined with undemanding in care. Thuja undemanding to the soil, does not like draughts. Is preferable to spring planting, the distance between plants up to half a meter. The root collar should be at ground level. During planting in the ground are made of complete fertilizer. The third year introduces spring top dressing. In summer the hedges of arborvitae moisturize, pour. Watering needed and after each pruning. It is desirable to protect the crown from winter and spring burns. Cut culture, from the third year after planting in a permanent place. The fence is to be narrow at the top for uniformity of illumination. Haircut TUI – surface, reasonable, a third of the length of the shoot. 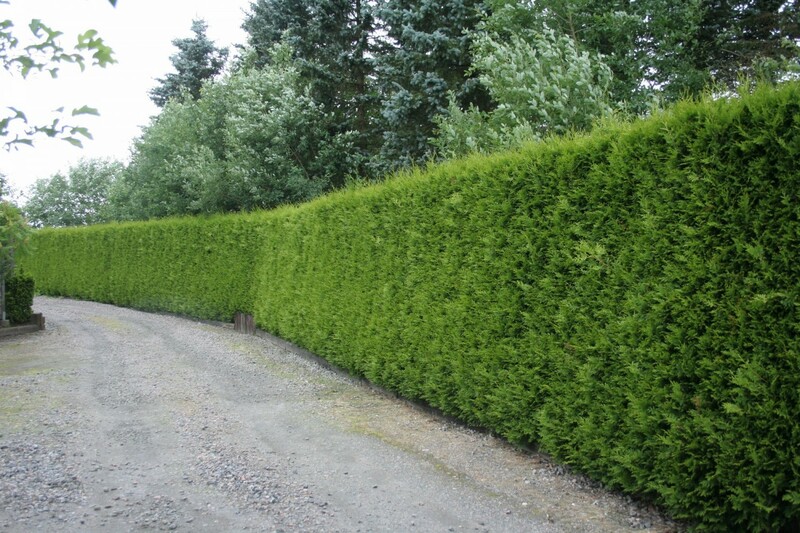 The hedge thicken the lower part, support smooth top, limiting growth and development. Every two or three years intensively cut tops. To clear the air, to preserve the beauty and to serve as a bright background for the garden can not only tapeworms. Of many in the coniferous, in addition to yew and arborvitae, in this role, you can select the fir. 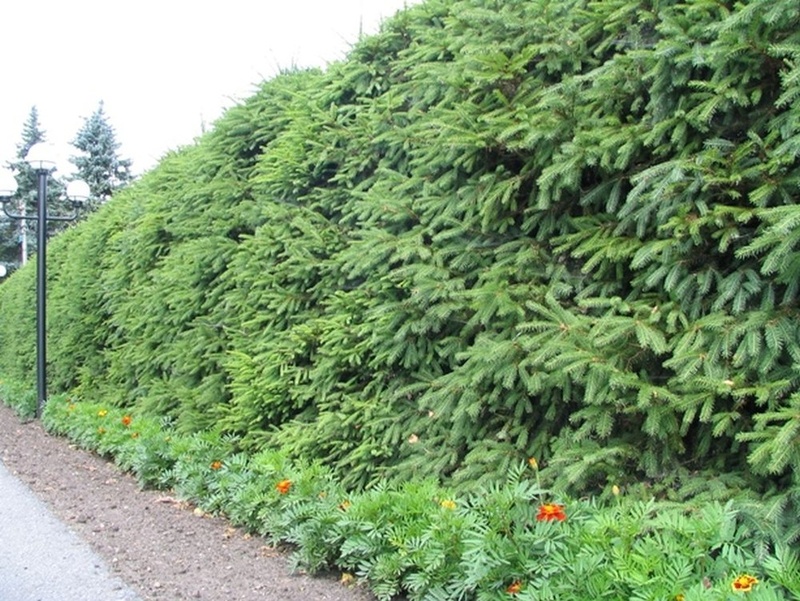 High, the living wall is able to create canadian, barbed, ordinary and Caucasian varieties, thickets are dense and fluffy. Interesting look with the Golden spruce and blue pine needles. The most drought resistant crops of evergreen – junipers. Spiky walls is better positioned there, where plants will play the role of the background. 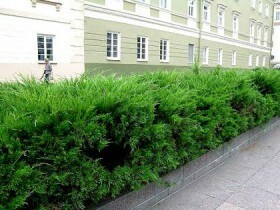 To create hedges can be planted in Sakhalin, Siberian and Kamchatka fir. 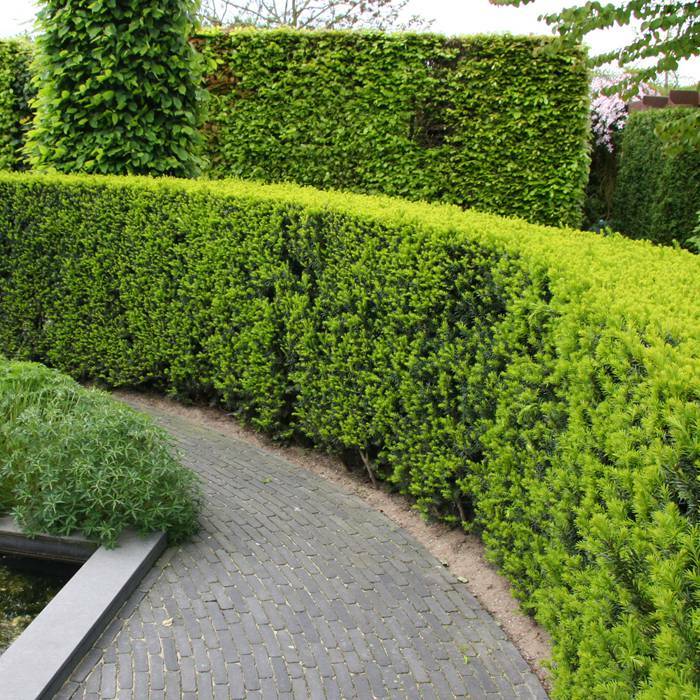 Fences give a rounded shape by cutting the tops. Wide crown aligned in a straight line. About the same, like tis, grown gorokhovoy cypress and cypress Lawson. In warm regions can grow plaskovitsky with a dense crown and radially arranged branches. In the photo: spruce fence. For junipers, firs and other conifers, selected for the role of fences, need slightly prichenennye or well-lit places with fertile and moist soil. Preferred loam, before planting it to make fertilizer, feeding is carried out annually. The requirements of different types, they need to look for when buying seedlings. Spruce and fir are planted at a distance from 80 cm to 120 cm, the cypresses and junipers up to 60 cm. All softwood fencing, in addition to juniper, need watering, especially in dry weather. These conifers do not cut in the first two years, allowing them to increase weight and to adapt to the offered conditions. From the juniper and cypress are pruned out of the line of the hedge branches. All other plants strong trimming not afraid. The first stage of formation – stimulation of development of the lower part, then increase the ride height. In June or may, the young shoots pinch out the tops to maintain the desired density of the crown. For conifers, the preferred triangular and trapezoidal haircut. Fir and fir-trees it is better to provide more freedom. Spruce fence cannot be run: wood older than three years do not touch. See our material, care of coniferous trees in winter. A high hedge of Siberian fir. The massive walls of deciduous hornbeam creates. During the winter he can not boast of the attractiveness, possess ephedra, but in summer and autumn creates dense green screen. These trees average in size, natural spherical or conical crown, by themselves – some of the best geometric. Grayish smooth bark, oval leaves, crop tolerance – all these qualities allow to obtain a dense and spectacular fences saturated colors. Fall foliage changes color to Golden. 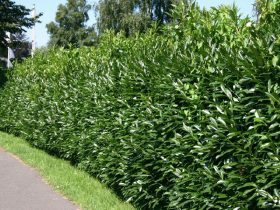 Of hornbeams create a green wall a great height, taller than a man. They are convenient to protect the site from the road or street with heavy traffic, culture suppress noise and cleanse the air. The plant retains the shape even in the absence of regular scrap. 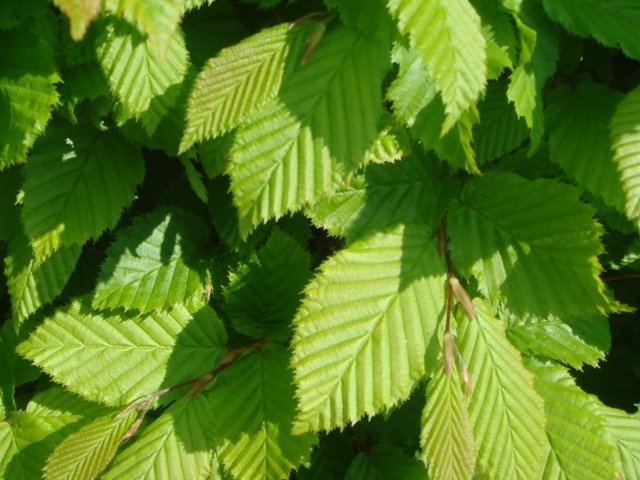 In the photo the leaves of hornbeam close up. For the normal development of the hornbeam need fertile soil, quality, fresh, not sour. Culture is used in the light areas, although it is shade-tolerant. Planting is carried out at a distance of up to 70 cm from each other, the age of the plant – two or three years. Pruning is carried out the following spring after planting, shortening a trees height, then form a crown. 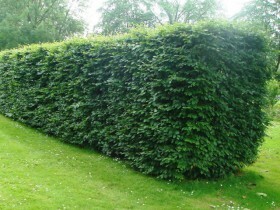 Hornbeam is not afraid of drastic pruning, the procedure is performed in late spring and early autumn. The height not holding back to seal the bottom of. For the formation of green walls three meters in height, you can use the lime, large-leaved and small-leaved varieties are also easily tolerate pruning, like other deciduous culture. A good alternative to beech. Unlike hornbeam plant brown leaves all winter. Buki is formed from the second year of cultivation, keep the height twice a year. Green fence requires the creation of a second row, the lower part of the fence may be exposed. 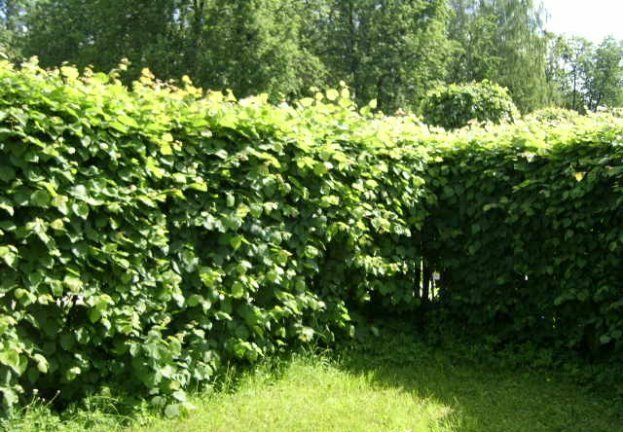 Screens are suitable for severe and elms with large leaves and dense foliage. Wide enough fences begin to form a few years after planting. The hedge of small-leaved Linden. 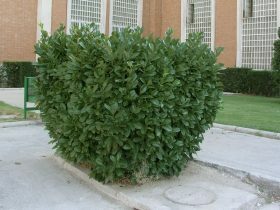 Crown boxwood, which is easily tolerate a haircut – the main advantage of this plant. It is often used for the topiary. Very beautiful, small, the living fence of boxwood today is the most popular. 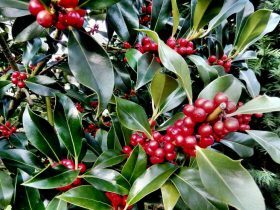 The main drawback – low winter hardiness. The crown of the shrub develops evenly and thus retains its shape. 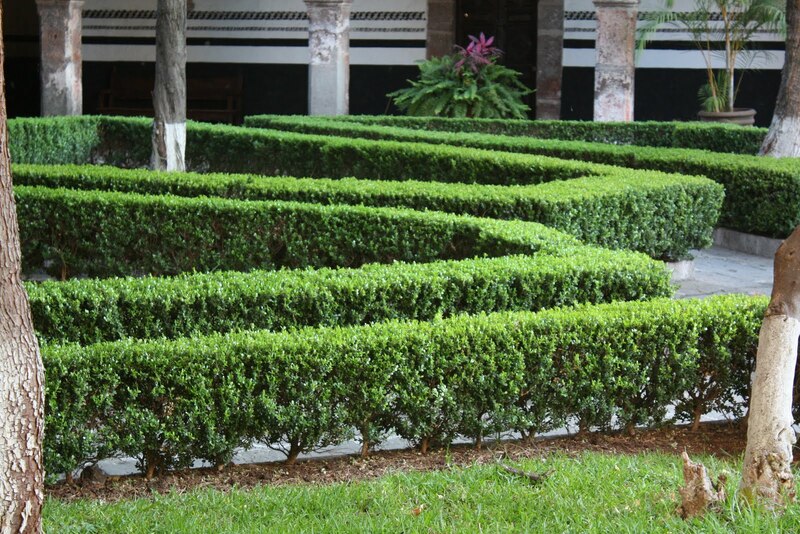 In the photo: the original hedge of boxwood. 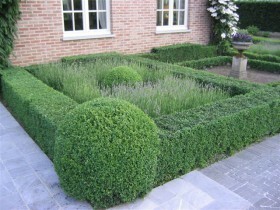 The boxwood is undemanding to the soil, although I prefer neutral or calcareous soils fertile. The culture needs a shaded or semi-shade place. If the site is Sunny, fence watered in the summer, and in the winter pritenyayut screens. The most difficult period of hibernation. With the beginning of cold season soil deeply impregnated with moisture and mulch with pine needles or peat. The fence itself shielding non-woven material. Planting done in the spring, the distance between the bushes – 20 to 40 cm. Growth cut by one-third, unnecessary branches, out of the fence, removed during the summer, woody parts is better not to touch. The first procedure held in April. From the bushes of hawthorn shape the topiary, culture and planted as fencing. Undemanding, hardy, durable plant that creates impenetrable thickets. Almost all varieties include sharp needles, their length can reach 10 – 12 cm. One of the advantages of hawthorn and autumn outfit, bright spots the fiery palette adorn the garden until the snow. Bush does not lose the ability to blossom and bear fruit even in dense plantings. The problem of slow development, the formation of a full hedge would have to wait two or three years, and ten. Almost every species of hawthorn are unusual, variegated forms, rare shades of foliage. 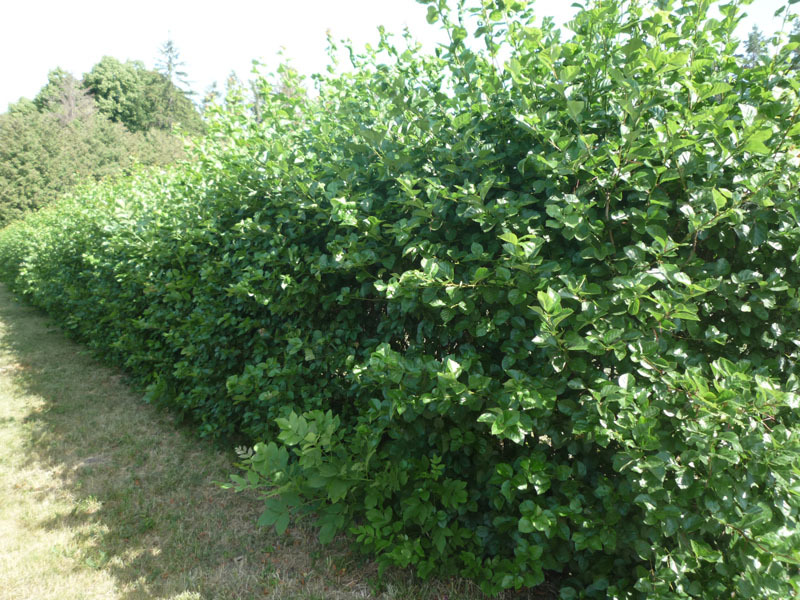 For planting hedges is better to use seedlings of hawthorn two years of age. The photo shows a fence of hawthorn. Hawthorn love a good light or light partial shade. The distance between the seedlings from 15 cm to 20 cm, planting material at an angle in order, to shoots intertwined. Fertilizer under the bushes made twice a year: mineral spring, organic autumn. Glaze of hawthorn are held regularly, in a drought more often. In spring, the soil loosened to a depth of bayonet, mulch with earth or peat. After planting the hawthorn immediately cut, leaving stems on 15 cm. 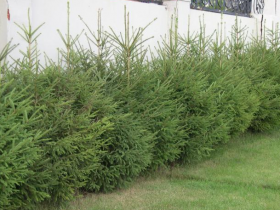 This allows to obtain dense thickets, perfect for the severe fences. The following spring pruning is carried out new, leaving one or two strong shoots at each plant, the rest is removed. As the growth is generated by a number of skeletal branches. The process is repeated when new shoots until the desired height and thickness. Formed Baryshnikova fence needs to maintain the "faces", which often impart a trapezoidal shape. Pruning one-third of the length of shoots better in the spring and in the first month of summer. 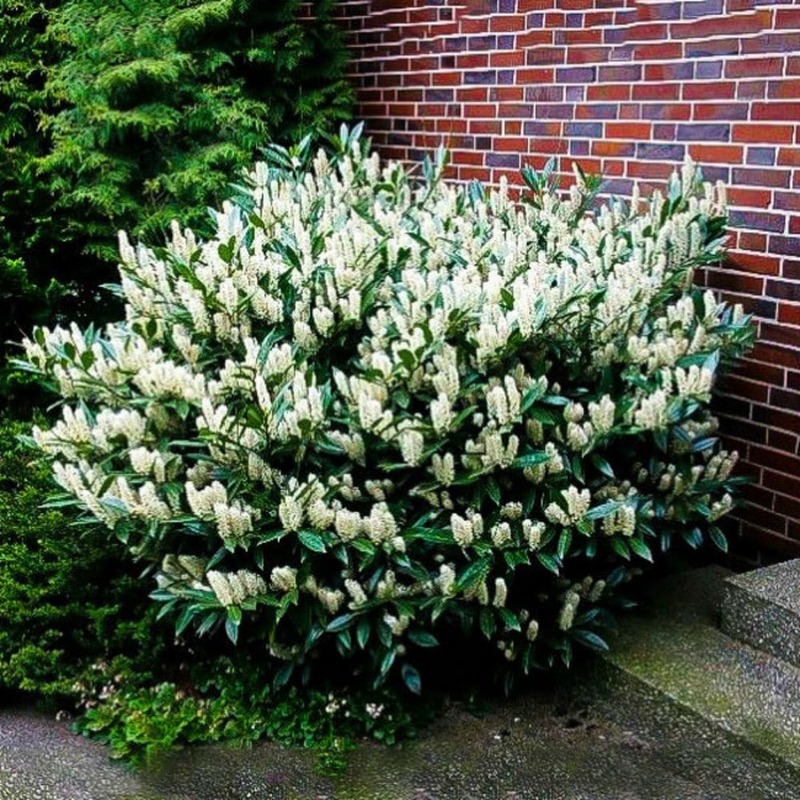 In warm regions the alternative to the hawthorn tree may be a Laurel – evergreen, fast growing shrub with beautiful variegated or glossy leaves. Culture loves the haircut, easily carries a decorative molding, not afraid of strong trim. 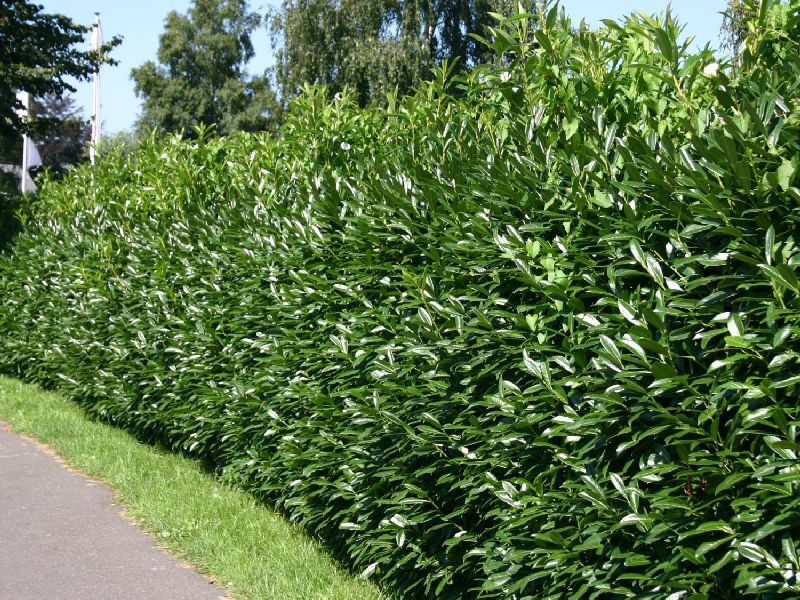 Hedge, a fence of Laurel. The Laurel is starting to bloom beautifully. 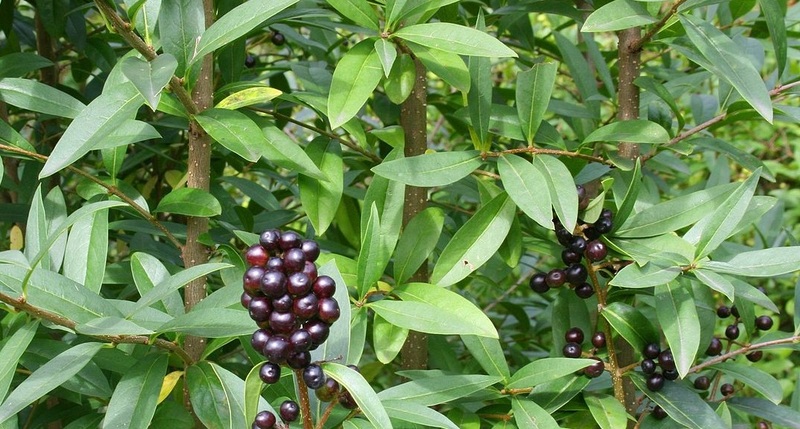 Height shrubs up to five metres, leaves – leathery, lanceolate, dark, reverse side is lighter. The dignity of a culture of active growth at a young age, fences are formed quickly and easily, thus, keeping the density and decorative effect. 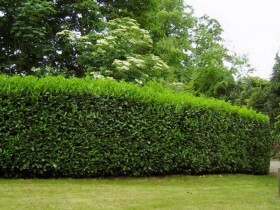 The plant allows you to create wide and beautiful hedges medium or low altitude. 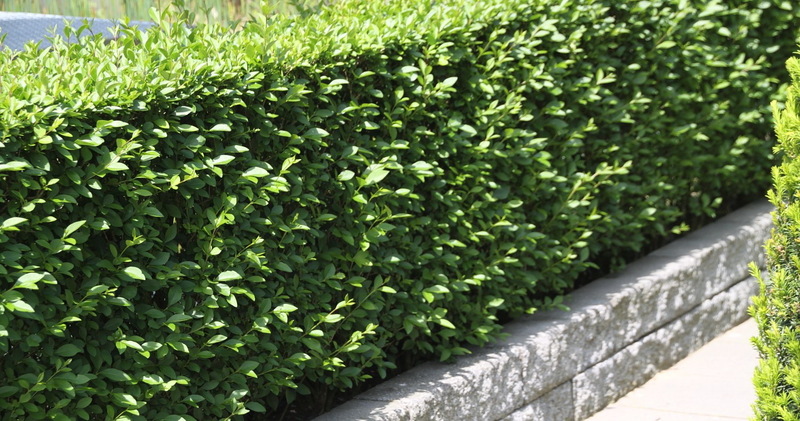 For the formation of fences are best suited ornamental Privet common. The shrub Privet only grows in the fertile soil, the remaining parameters are less important. The most effective fences are formed on the sun, some varieties are shade-tolerant. Culture is drought-resistant, easily tolerates polluted city conditions. In cold regions Privet can freeze solid to the snow level, but quickly recovered. On the attractiveness of the fence are bad wintering is not affected. 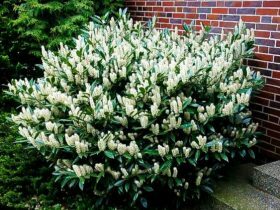 Shrub maintenance, responds well to a comprehensive feeding, which is carried out in early spring. Planting material is located at a distance from 30 cm to 50 cm from each other. 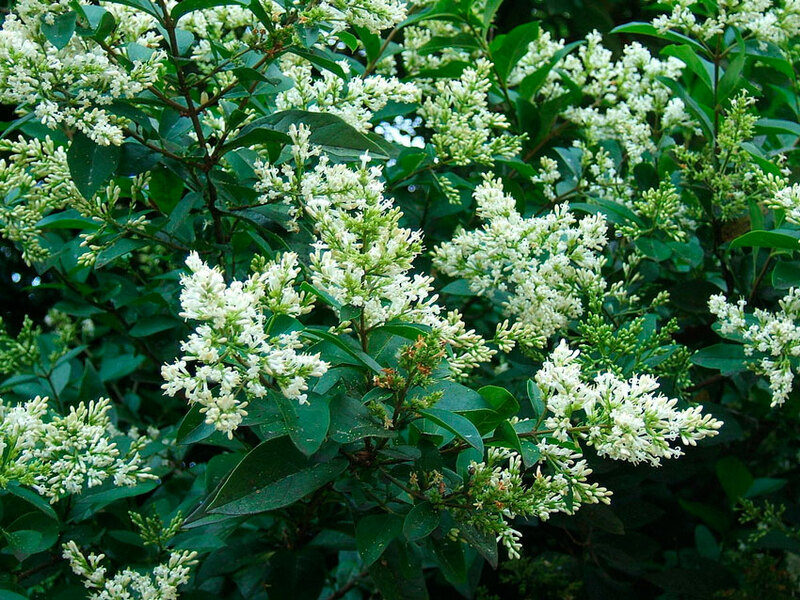 Flowering Privet, quite strong flavor. 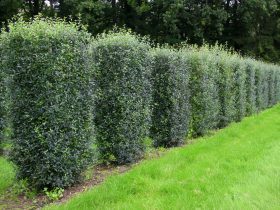 A hedge of Privet bushes at some distance, openings. 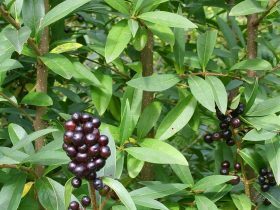 The fruit of Privet is not edible. The fence, a hedge of Privet bushes. 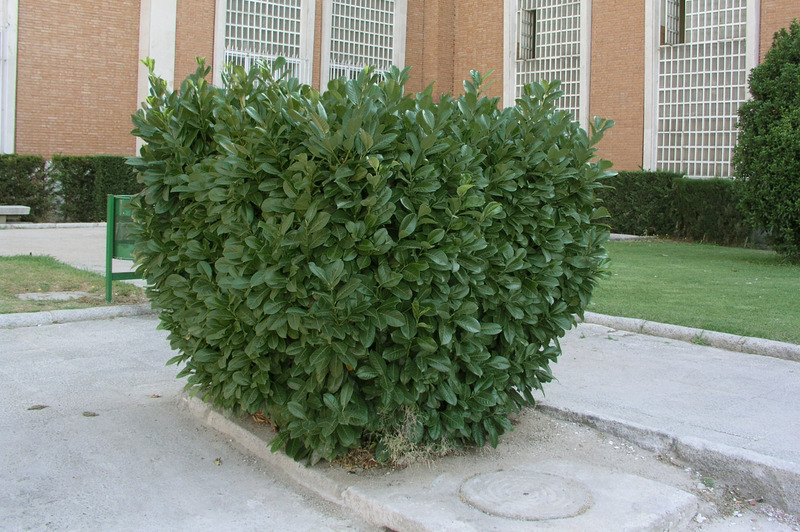 The first pruning of the Privet – cardinal, all shoots are pruned to 15 cm. For the next season begin the formation of fences, first, pay attention to the bottom and control the height. 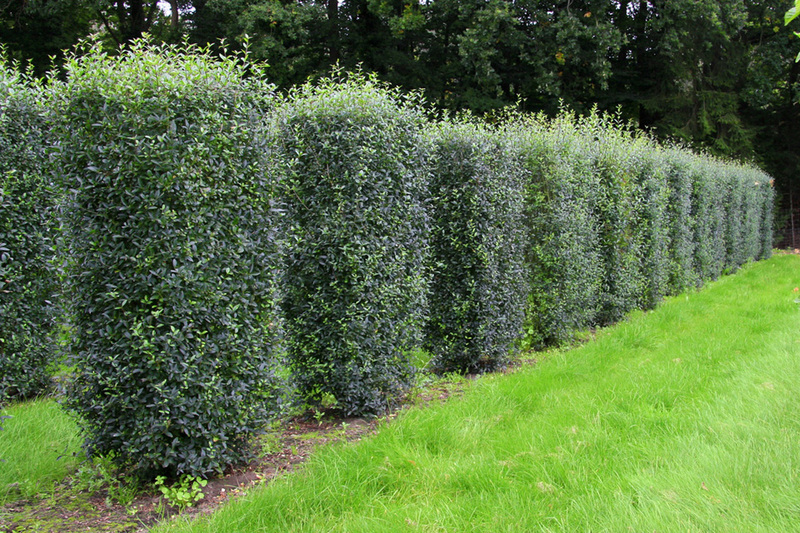 Further trimming of Privet spend up to three times a year, achieving the desired shape and height. Plant sculptures in the garden. Experienced growers are doing on your site is not only the planting of hedges, but are also involved in plant architecture, the formation of trees and shrubs in the form of various objects or animals. 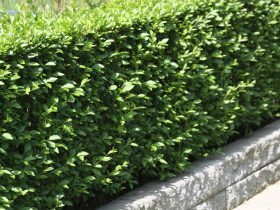 The principles of growing and pruning remain the same, as for evergreen shrubs. The fence is made of beech. The hedge of juniper Cossack. The formation of the spruce hedge at the site. Video working, run, watch and listen to useful advice from other professionals landscape design. All content on this site SamDizajner.ru written specifically for Simdesigner, copying 1 in 1 strictly prohibited. Reprint, full or partial rewriting of the article “Strict hedges-fences: the best types to fit 25 photo”, possible, only when you specify the full, active link to the source.